“A National Book Award finalist unravels the compelling back story of the 1980 eruption of Mount St. Helens. Olson (Count Down: Six Kids Vie for Glory at the World’s Toughest Math Competition, 2003, etc.) combines nature writing with an investigative focus on the political, economic, and historical factors that changed the way scientists study volcanoes. 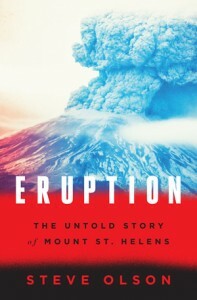 Whether the author is delving into the dangers of working in the timber industry, offering an overview of the state of volcanology in 1980, or recounting the stories of individuals living and working near Mount St. Helens, his writing propels readers swiftly along as the story races toward the massive blast and its aftermath. Olson details the story of Weyerhaeuser, the infamous Washington logging company that owned “substantial portions of the land between Mount St. Helens and the Pacific Ocean.” The author weaves in both the corporate and family history of the Weyerhaeusers (“an American dynasty”), using that remarkable story as foundation for his narrative. This framework offers a compelling look into the region’s environmental and social history and how the company and the timber industry shaped a region. “It is difficult to overstate the significance of Weyerhaeuser Company to the history of the Pacific Northwest,” writes the author. “Weyerhaeuser and other economic interests have formed the backdrop against which much of the region’s history has played out.” Olson pinpoints 1980, the year of the eruption, as significant due to the social, economic, and environmental changes taking shape across America and what these shifts meant for the timber industry. The author provides an engrossing explanation of volcanology during the 1980s and how the eruption of Mount St. Helens altered the prevailing science. He also captures the forgotten or untold stories of the individuals who perished in the blast and describes the political wrangling surrounding the status of the devastated area.